Dominion Cross-Sell Reports are the leading solution for auto data in the industry, providing dealers, media companies and financial institutions with market-specific vehicle sales and registration details. 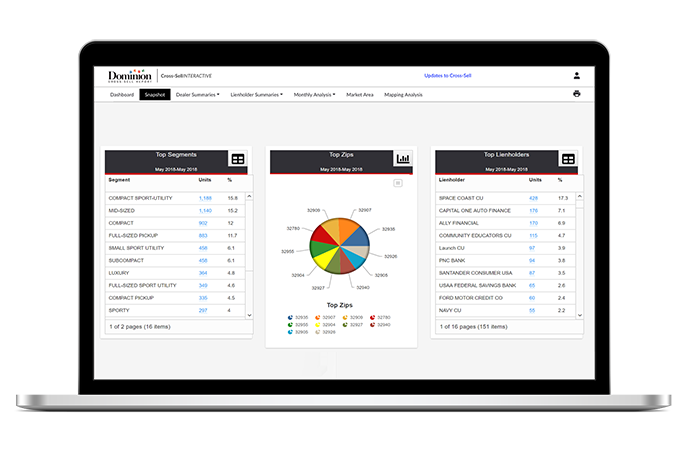 Cross-Sell Interactive gives automotive dealers a strong competitive advantage by delivering instant access to powerful market and competitive intelligence about regional auto sales. We record and compile new and used vehicle registration data from our 23 partner states to produce comprehensive monthly reports that are custom-made for each dealership’s specific market. Now offering On-Demand Cross-Sell Reports. Click here to order now! Available quarterly for the previous period, the MarketINTEL Report delivers extremely accurate market intelligence for a defined location. 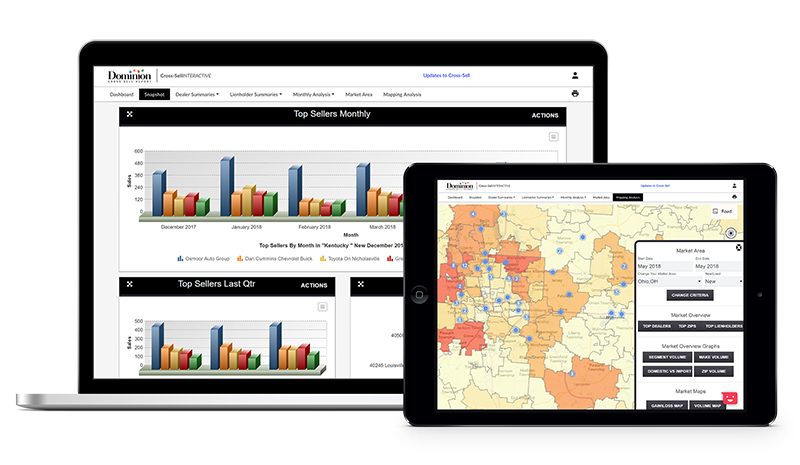 It enables dealers to pinpoint and understand the trends impacting their market and uncover new market opportunities. Detailed, but easy-to-read maps, charts and graphs clearly indicate the zip codes where sales are increasing or decreasing. Statewide heat maps make it easy to track trends. 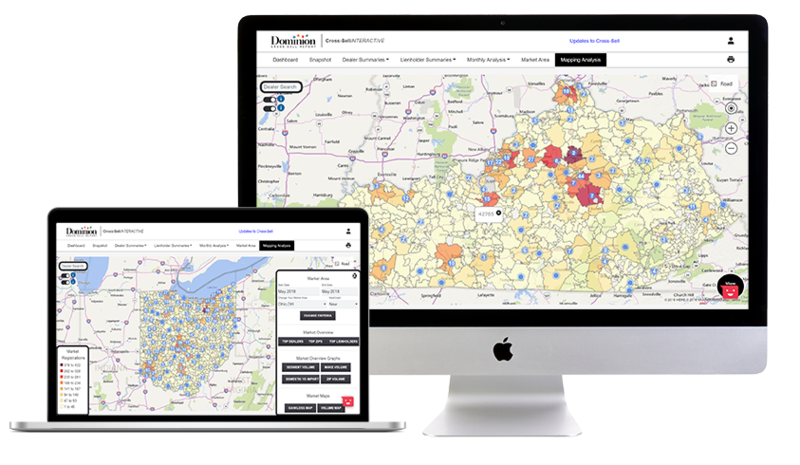 Users can view new and used vehicle sales by dealer location, owner location and liens for both new and used vehicles within the defined area. The SnapShot Report is an at-a-glance source for key auto market data information. It compiles several important market statistics into one document, providing a high-level analysis of how sellers and specific vehicles are performing in any user-defined market. 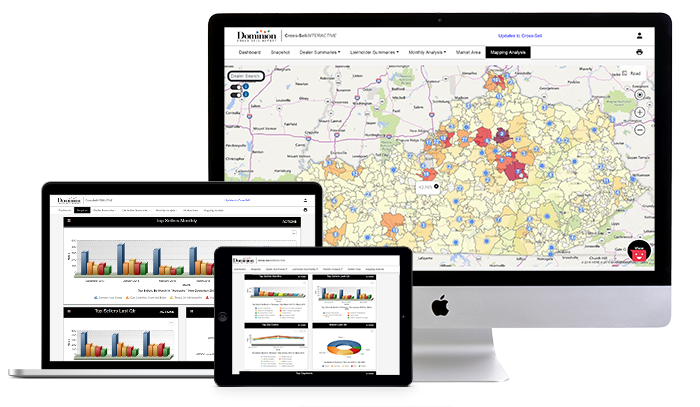 The information is ranked based on each dealer’s sales performance in the market and clickable to allow the user to explore the underlying data. Stay ahead of the competition with quick data for quick action. The Cross-Sell Market Analysis Report helps you better understand the local automotive market and uncover opportunities to gain new business and steal market share. This report compiles official vehicle registration information provided by the department of motor vehicles in each of Cross-Sell’s 23 partner states. 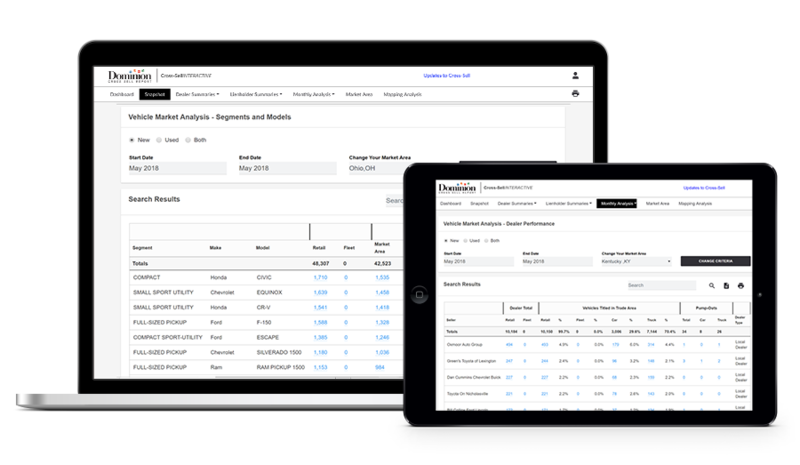 Dealer Summaries and Lienholder Summaries (where available by state law) help you keep your finger on the pulse of your local market. Learn how data-based decision making is fueling the competitive advantage dealers seek to surpass competitors. Read this blog to learn how to create a strong vehicle acquisition strategy with help from a trusted source, MarketINTEL reports.